Children thrive when they have opportunities to interact with the world using all their senses, to follow their own interests, and to develop caring relationships with adults and other children. The teacher's role is to encourage curiosity, to help children develop self-reliance, and to be a caring, consistent source of support. A developmentally appropriate program helps children develop a lifelong love of learning and builds a foundation for future academic achievements. 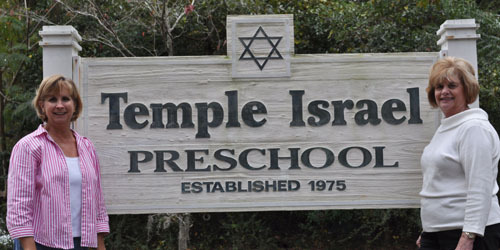 Children of all faiths and cultural backgrounds find a home at Temple Israel Preschool. Your child will be exposed to Shabbat (Sabbath), the Jewish holidays, and many of the ethical teachings of the Jewish tradition. We are aware of the divine spark that resides in every child and strive to teach our preschoolers to be aware of the divinity in each other. This awareness forms the basis of mutual respect and cooperation. Directors Diane Atkinson and Judy Winn have both been TIP educators for more than 25 years. Miss Diane and Miss Judy get to know each child and each family as individuals. They visit classrooms daily to support the teachers and coordinate the school program.